People can read this to find out what are the best Christmas trees for a small apartments, rooms or spaces being good value, great looking and perfect for any setting! After all, we don't all live in big houses and most of the larger kinds of tree are only suitable for larger size rooms or living space that you get in larger houses or really big apartments. So what should you be looking for in a tree that will suit your own small condo or apartment? What would make a suitable small apartment Christmas tree the perfect one for your living space for this holiday season? These and other similarly related questions are answered here in this festive themed article. So let's get started by covering the most important factor governing what would make a suitable choice for your home. Generally, you'll need a tree with a slender profile that doesn't take up very much floor area. That's probably an obvious statement, but it's one that has to be gotten out of the way before we can continue. When you live in the kind of apartment that seems like it was made to be more of a walk-in closet for the place next door than a home in its own right, you'll know all about coping in cramped living conditions. Every square inch of floor space is precious. That's because you simply don't have enough of those little squares to spread yourself out properly. You probably already have every piece of furniture positioned to maximize what little floor area there is available. So the very idea of adding anything that might steal more precious square inches of your already super-compressed area of visible floor fills you with dread! However, the "festive season" is one that demands that you do your best to make your home feel, well... festive! And that means at the very least having a really nice looking tree that you can decorate and light up to provide the suitable ambiance. The main problem is this: Most trees that you would feel deserve a place in your home tend to be way too big and would take up every last free inch of your available floor space... and some! Thankfully, there is a solution! There are specially designed slim artificial trees that stand tall enough to give you the kind of display you want, while being masterfully miserly in their square "inchage" (as opposed to "footage") requirements! For that reason, the rest of this article is devoted to bringing you some examples of what is possible. I'll be looking at what you can use to beautify your apartment this Christmas with a suitably compact but great looking tree that is deserving of its place in your small but homely abode. 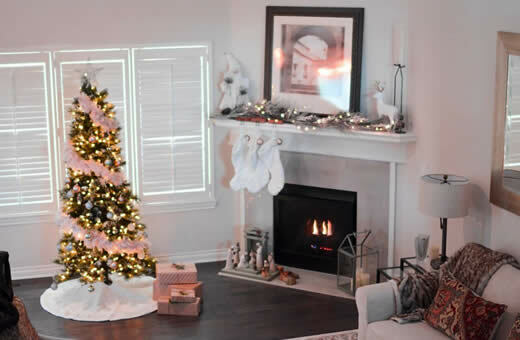 You should really be aiming at the kind of tree that has a small maximum diameter when the branches are fully extended so it will not hog more than its fair share of the available space in your room. When researching some of the best Christmas trees for small spaces, I discovered there are a number of really narrow but truly beautiful trees on sale right now. These are the kind that can be set up in the smallest of places and still look absolutely amazing while not taking over the whole room. When choosing the kind of tree that will best fit into your free space, remember to make sure you buy one that will look amazing with lights and decorations. I'm sure you don't want a super skinny tree with hardly any substance to it. Especially if it ends up looking like little more than a broomstick with a few lights and strips of tinsel strewn around it! The solution is a slender but well clothed tree with thick looking branches and plenty of scope to decorate into a stunning showpiece to be proud of. First off, you need to do some measuring with a rule or tape and then sit down with a cup of coffee to do some planning. It's best to do that with a pencil and rule on graph paper, the good old fashioned way. This, believe it or not is actually pretty quick and easy. It will give you an easy-to-read, graphical representation of what you have and what you can spare for that certain decorative centerpiece. Start by drawing a rough diagram of your apartment's main room, or the room you are going to be putting the tree in. What you are really interested in is the overall floor space you have, what's available and what you need to keep free of obstructions. The drawing doesn't have to be draughtsman quality. Just a decent sketch will do. That's because you really only need to get a good idea of what you have to work with. Be sure to mark out all your furniture and where it is all placed. Also mark out access ways through the room, like for instance your main walkway from one door to another. Include the measurements you took and then consider where you want to put the tree. You'll be able to see at a glance where it will fit, how much space you have available and how much diameter width you can allow for. Now for the physical, leafy-looking solutions. Let's look at some really inventive, clever and creative Christmas trees and their alternatives for small space or restrictive size habitats that will still look great and make a festive centerpoint for any small home. First of all, you really have to consider the available living area you have in the room you intend to place the tree and whereabouts in that room you'll put it. If you are really pressed for space, you might want to consider a corner tree. This is literally a quarter slice of a tree that is designed to fit right into a corner with branches (and lights if it has them) only on the front! There are several kinds that are lit or non-lit and they come in several different colors and alternate heights (see the image to the right of an example of a corner/half tree. Update 2018: Unfortunately most major online stores (even Amazon!) are out of stock of many of these items, so the link has been temporarily removed until stocks are replenished. With a little more space available, you could opt for a "half tree" that can be placed against any wall in the room. This is what is sometimes called a "flatback tree" as it only has branches to the front aspect, allowing it to stand flush against a wall. The design allows it to take up only half the space of its full size alternative which I think you can imagine is a great way to maximize your available floor space. They're designed to be very stable once they're up and covered in decorations, so there's no need to fear them topping over. While they may look "front heavy" they're actually very well balanced to prevent accidents. The benefits of this kind of option are in the size of the decorated part that can be displayed in the room. It packs a lot more visual impact than a corner tree, thanks to it spreading out to full width while remaining very slim in profile. These cleverly designed flat-backs are the ideal solution as a viable option for festively decorating a small living space. There is another great alternative if you aren't really sold on the idea of a corner or half (flatback) version. That's to get a complete, full-circle profile slim or "pencil" tree that just happens to be a whole load slimmer in diameter and with a smaller footprint than a regular artificial Christmas tree. There are a surprising number of choices that fit into this category. They come in many shades of green as well as a kaleidoscope-like array of other different colors. They come in a variety of shapes and range in height from the desk-top variety of truly tiny to full height varieties that can stand over nine feet tall! There are varieties that are not lit, allowing you to choose how you want the final look to be. There are those that come pre-lit with a spectacular array of white or multi-color lights. Many of these gorgeous slim Christmas trees are actually very decorative and stunning to look at. Surprisingly, they often out-perform their full size counterparts in the "WOW factor" department when visitors set eyes on them for the first time. These slender but stunningly beautiful alternatives to full-size versions can certainly transform your apartment and give it a feel of having more space when fully decorated. Click the image to the right to see more examples of slim trees like this! In the last category come the more unusual kinds of shapes that often don't resemble pine trees at all! These special and unusual creations come in the form of decorative shapes in seasonal colors. They are designed to give that special, eye-catching and unique centerpiece to your apartment. These probably qualify for the term "Christmas decoration" rather than a traditional looking artificial conifer, as their shapes can be quite interesting and non standard. I've seen some amazingly tastefully decorated topiary style "trees" as well as crosses, cylinders, cones, globes and arches. I've also seen strange looking distorted twig-shaped offerings that were festooned in all manner of amazing decorations and stunning lights! The variations on this theme are literally only limited by your imagination and whatever you have to hand to create something really special and unusual. Click the image to the right to see an example of a cross shaped tree like this! Choosing a suitable tree to fit into the available space you have in your home is an art form for many people. When you get it just right, you can stand back and take great satisfaction on the festive effect you have just created while still being able to move around the place without being attacked by protruding branches. Whatever you decide is right for your smaller apartment, condo or studio, there are plenty of options available to decorate it this Christmas, with trees in all shapes and sizes to suit your individual needs and space constraints. So make it a good one and get busy with the decorating, because you can amaze yourself and your friends with what is possible!